Are you looking to add more plant based meals to your diet? I am! I have watched a few documentaries lately that have convinced me that I eat too much animal protein. Now, I am not giving up meat totally, but I just want to have the option to eat a plant based meal once or twice a week. 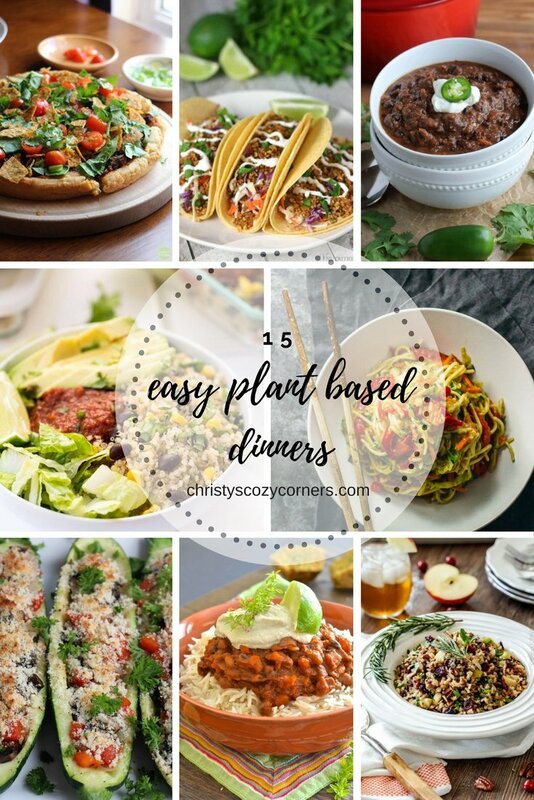 I’ve got a round-up of 15 easy plant based dinners for you. If you like portobellos, this is an easy meal to start out with since it can be cooked in a crock pot. It has portobellos, wine, garlic, onion and lots of spices. Here is the recipe recreated by The Virtual Vegan (originally from the Plant Based Journey). The key to this recipe is taking the time to make the vegan protein marinara sauce, spinach ricotta and a creamy cashew cream. It gets layered with wheat noodles like normal lasagna. Then you bake it until it is nice and bubbly brown. This recipe was created by Pass The Plants. I love a good bowl of chili on cold nights. This is filling and has a great flavor to it. The recipe can be made with beans that have been soaked overnight, or you can use canned beans. The sweet potato makes it more filling. How can something with a square of dark chocolate and fresh herbs taste bad? This is another great recipe from The Virtual Vegan. I know, you are thinking, “No way,” but you’ve got to keep an open mind and give it a try. This recipe is filled with protein and has a wonderful creamy cashew sauce with a hint of lime. The ground up walnuts with chilli powder, cumin, garlic a touch of soy is a meat substitute that you can live with. Top with your favorite toppings and the creamy cashew sauce with lime. This recipe is by V- Nutrition and Wellness. This is a recipe that you’re going to want to make at least twice a month. Zucchini stuffed with finely chopped roasted vegetables is the key to this dish. This is an easy meal prep, and it makes a good dinner for during the week. This recipe comes from Krazy Kitchen Mom. Soup is a great option for dinner, and this Black Bean Soup recipe is hearty and will warm you up. You can leave out the olive oil and just use vegetable stock. Black beans, red pepper flakes and jalapenos kicks the soup up a notch. This is another great recipe by Krazy Kitchen Mom. In order for me to survive, I have to be able to make pizza. It needs to have lots of flavor, and it has to hold up well. This is a pizza that is over a bed of lettuce. It has a cornmeal crust with black beans. 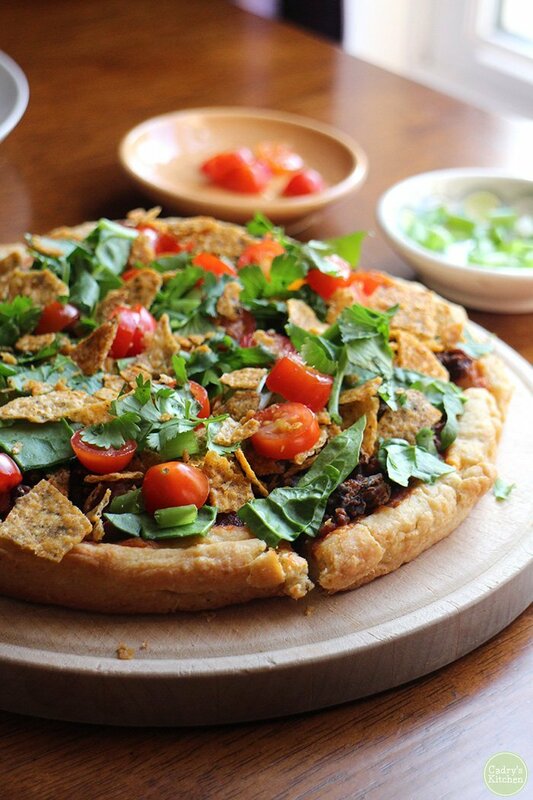 It is the ultimate taco pizza, and it will fulfill your cravings. This recipe is by Cadry’s Kitchen. A great stir fry makes my life easier, and this one is flavored with homemade teriyaki sauce. I love the taste and the wide variety of veggies I can utilize in this recipe.The jasmine rice is great and brings this dish all together. This recipe was created by Educating-Earthlings. I love burrito bowls because they are a good dinner option, and the leftovers pack easily for lunches. This calls for a basic quinoa salad with black beans and corn. You can then add whatever you like in your burrito bowls. I add lettuce, tomato, red onion, avocado, fresh chopped cilantro and a squeeze of lime juice to bring it all together. This is a recipe created by Simply Quinoa. I utilize whatever veggies I have left in the refrigerator to make this dish. The sauce is simple with 3 ingredients. Then use whatever noodles you prefer. It simple, but it is tasty. Dinner is on the table in about 20 minutes when you make this. Here is a recipe by Savory Tooth. I love enchiladas, and this is a recipe satisfies that craving for this Mexican dish. The jalapeno gives it the kick with the other veggies and spices. Here’s the recipe from Two Peas and Their Pod. When it is a hectic night at home, one pot dishes are a lifesaver. This dish is a delicious time saver. It is made with coconut milk and vegan red curry paste. Here is an easy, flavorful recipe created by Vegan Heaven. Another great one pot dish is this One Pot Peanut Sauce Noodle recipe from Vegan Richa. This yummy, creamy peanut flavored sauce poured over veggies and noodles is filling and only takes 20 minutes. If you want a hearty salad with leftovers for lunches, this is the perfect dish. The apples, cranberries and pecans blend together with the apple cider vinegar and wild rice, and it is healthy, colorful and delicious. This great recipe comes from Carlsbad Cravings. A ratatouille is a great option to make since it is easily frozen,and you can simply pop in it the microwave. Delicious fresh stewed veggies baked in a tomato based sauce is easy and bursting with flavor. I love how healthy it is, and you always want more. This simple dish was created by A Clean Bake. I would love to hear what meatless, plant based dinners are your favorites. Happy cooking!